Do you have something about Christmas that is your absolute favorite? Something that you can look at over and over again no matter how many times or how many variations, that just fills your face with smiles? For me, its Snowmen. I love Snowmen so much and they are my favorite decoration for Holidays and Christmas time. I have snowmen ornaments and snowmen stocking hooks. Snowmen decor for outside. Snowmen decor for in the house. A few years ago, I painted a ceramic with a Mom snowman and two babies. 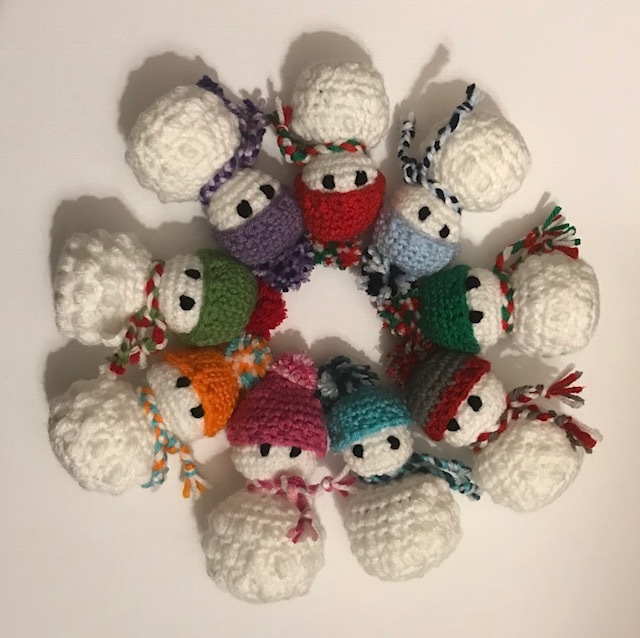 I’ve scanned through Ravelry and found so many crocheted snowmen and I just want to crochet them all! I had an idea to find a mini version and create one for each of my team members at work to gift with a Christmas card. I thought it would be a nice warm addition to their cube for the month and maybe put a smile o n their face. 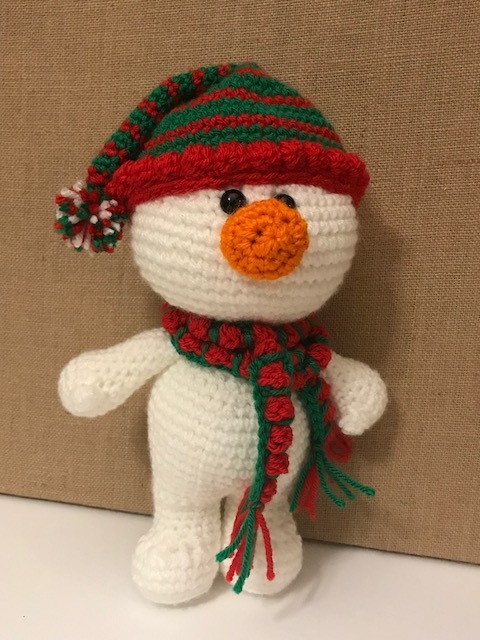 So I found this little Scarfed Snowman on Ravelry and made a bunch. My kids even loved them so they were included in the count. Each is crocheted in one piece, so NO sewing! I prefer that method myself. I love how the bottom half of the body has a little more texture. And then a simple single crochet hat and a braided scarf in fun colors. Quick whip stitch eyes and you’ve completed him! Lumi the Lovely Snowman by The Craft Fox Crochet was just released this week on her Etsy Shop and I had to create her immediately. I find her vintage look adorable. This pattern used chunky yarn for the hat and scarf. In my picture I used two strands of worsted weight yarn to get the same affect. Her pattern is very easy to follow and she stands about 10 inches tall depending on your gauge, hook and yarn choices. Lastly, Oatmeal the Snowman, created by Made By Mary, was another must for me because he has a complete body! I love his cartoonish look. And her pattern was expertly and cleverly created. I actually said “oh wow, what a cool way to assemble him!” when I read through the pattern. He has feet and thumbs! And a cute, round nose. His bobble hat and scarf were a nice touch. He stands about 10 1/2 inches tall. 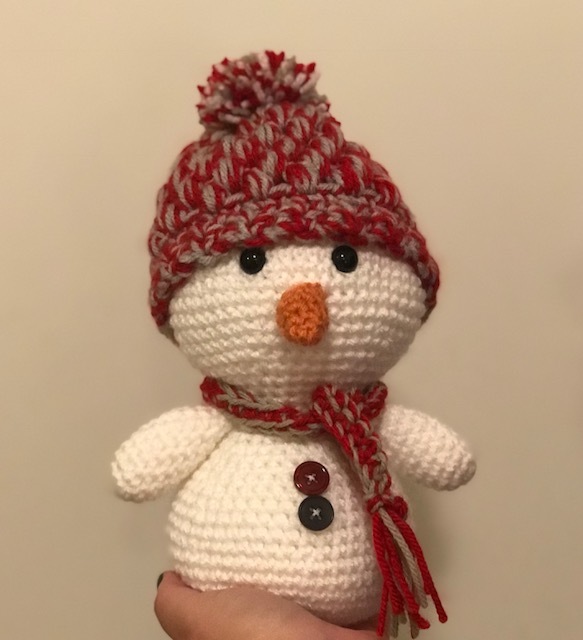 There are couple other snowmen patterns I want to try. But I will be making many more of these three over the next few weeks for orders and gifts. 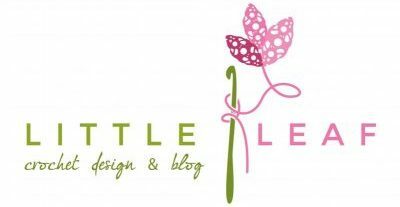 Check them out, you will love them.